New Orleans is a city that plays to the sense, and once it’s treated your eyes and tongue, it needs to play to your ears. Music can be heard everywhere, from street performances to smoky clubs to giant concert halls. 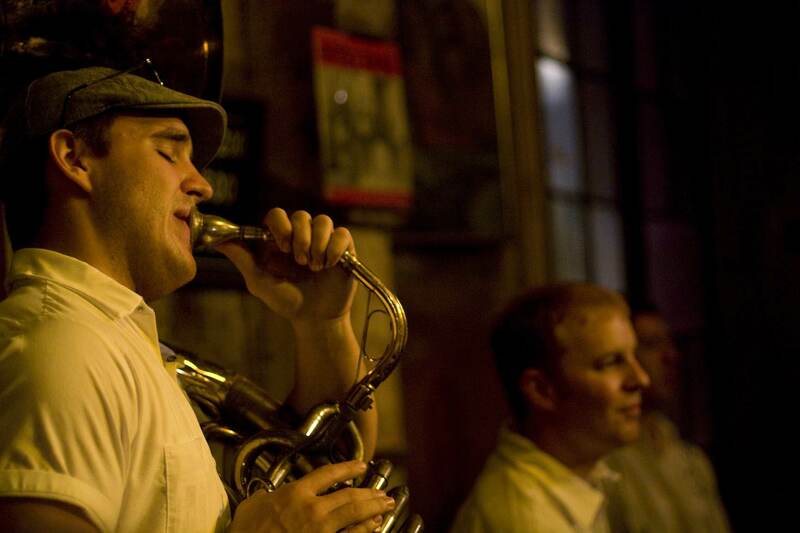 New Orleans is the birthplace of jazz, a genre of music that is plagued by misconceptions. In short: New Orleans jazz is improvisational music that originated in African American communities that makes use of brass instruments, ragtime (itself a 19th-century black dance musical genre), the blues and European influences such as the music used in the French quadrille dance. The most famous jazz venue in New Orleans is Preservation Hall. ‘The Hall,’ as it is known, is dedicated to old school, Dixieland New Orleans-style jazz, and even the French Quarter setting itself, with its peeling walls and crumbling eaves, has a preserved-in-amber quality. But if you want to see some jazz here, beware that you should get in line about an hour before each set, and even then, you may be left standing during the often at-capacity shows. Is it worth it? Many liken a show here to a pilgrimage, and it’s not too hyperbolic to claim a certain sense of transcendence accompanies an excellent Preservation Hall show. If, rather than waiting in line, you’d prefer to sit and order some exceptional food, head to Snug Harbor on Frenchmen St, one of the city’s most famous live music strips. This is a classy setting for classy shows, with good sight lines to the stage complemented by a regular lineup of excellent acts, including consistent appearances by the Charmane Neville Band. Across the street is the Spotted Cat, where the atmosphere is a little more raucous; there’s no sitting or dinner service here, just dancing in a packed bar with lots of like-minded jazz lovers. While it’s more known for being a friendly neighborhood bar, the backroom at Buffa’s is one of the best jazz venues in the city. Starting at 10:30am on Sundays, a jazz brunch packs in locals and tourists, but the lowkey acts that regularly hold it down on any given evening are where this venue shines. Where Snug Harbor is cocktail dresses and wine, Buffa’s is work boots and a shot. Brass music is distinct from jazz; it’s less improvisational and far more danceable. Many brass bands still play traditional music inspired by marching band arrangements of the 19th century. Others, like the streetwise Rebirth, fuse styles from ‘trad’ jazz to funk, R&B and modern jazz. Rapping trombone player Trombone Shorty jumps between genres like a frog, sometimes bouncing into hip-hop, R&B, and even indie rock. When you think of New Orleans music, you’re likely thinking of brass bands; seeing a live brass show is a capstone to many New Orleans trips. Many local brass bands have ‘home’ bars where they play regular gigs when they’re not on tour. Rebirth famously tears it up at the Maple Leaf on Tuesdays; fair warning, the show can get packed with Tulane and Loyola students during the school year. The Soul Rebels are another brass band that often mixes hip-hop into their sets; their regular show is at the excellent Les Bon Temps Roulé on Thursdays. The Treme Brass Band, on the other hand, is a more old school outfit that plays brass classics largely drawn from the early 20 century. Their regular gig is in Club Soul, perched at the edge of the Treme. With all of that said, if you want to experience brass music the way it was meant to be heard, go to a Second Line. These community parades are put on in African American neighborhoods every Sunday of the year, barring June to September. Second Lines are the closest way you can access the ‘backstreet’ – the Afro-Caribbean-influenced folkways that permeate African American culture in New Orleans. 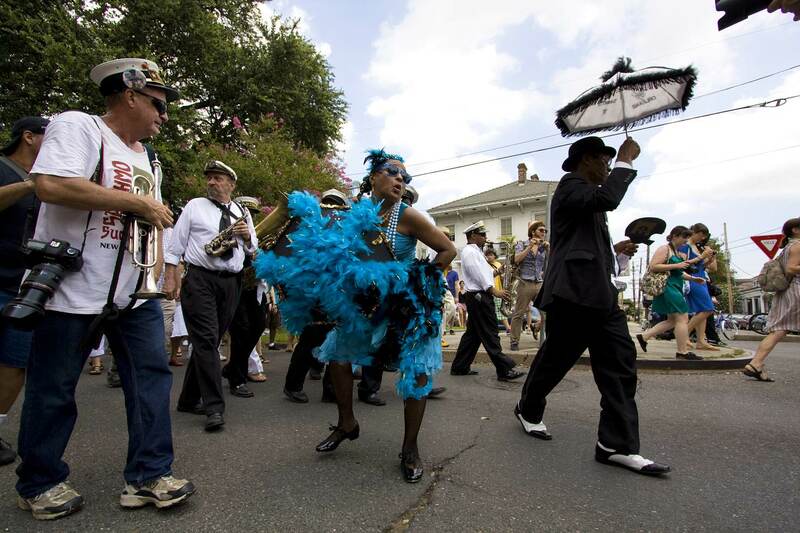 These parades all feature brass bands and intense Second Line dancing. New Orleans isn’t just brass and horns. The city has a long homegrown tradition of metal and punk, both of which get good play at Siberia. To be fair, this eclectic little venue plays genres of all sorts, from blues to funk, a quality it shares with similar concert halls on St Claude Avenue, which now sits at the edge of New Orleans gentrification in the Faubourg Marigny neighborhood. Nearby, the AllWays Lounge always has a quirky lineup that jukes from experimental rock to country to R&B dance parties. One of the types of music you’re likely to hear on St Claude Avenue is bounce, currently the defining sound of young African American music in New Orleans. It’s a high-speed genre distinct to the city that involves drum-machine driven beats, call-and-response, sexualized lyrics and extremely raunchy dancing (twerking was invented in New Orleans). Bounce music has gotten national attention via artists like Big Freedia and Katey Red and the cultural phenomenon that is twerking; besides Siberia, the music is played at clubs across the city, including Republic.